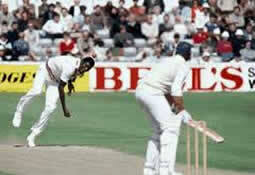 Cricket was introduced into the Caribbean by the British, who took the game into every country they colonised. In the post-war period, the West Indies produced some great teams but the game remained dominated by Australia and England. At one stage, the West Indies went 21 Tests without winning. The legacy of colonial rule persisted. Although the bulk of the team was black, the captain was always white until Frank Worrell was chosen to lead the team on its 1960-1 tour of Australia. In the next decade, West Indies teams earned themselves a reputation for “calypso cricket”. They were entertaining, performed amazing feats of batting and bowling, but generally were prone to buckle under pressure. This seem to “confirm” the racial stereotype of a bunch of happy black men who just did their own thing. 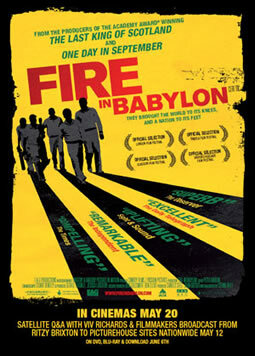 How this changed is the subject of the film directed and written by Stevan Riley, which weaves together the revolutionary fervour that gripped the Caribbean at the time with the emergence of a disciplined team of world beaters. The new generation had been in colonial times but grew up in independence times. Cricket, for the masses, was to become one way of throwing off the wretched identity that came from slavery and asserting a new collective personality. In the Caribbean there is a saying, says an historian, that ten youngsters thrown together is not a team, it’s a gang. The new generation needed a great captain to mould all the players from the different islands into a single fighting force. 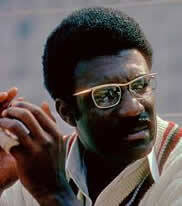 Enter the softly spoken Clive Lloyd from Guyana. His authority and leadership turned a talented group of players into world beaters who dominated world cricket for a decade. Lloyd, 10 years older than most of them, earned their respect. But the team grew through a baptism of fire. In 1975-6, they toured Australia and were destroyed by the legendary pace bowlers Jeff Thomson and Dennis Lillee. None of them had experienced such fast bowling before and they crumbled to lose the series 5-1. “It was war,” says Greenidge, “and they took no prisoners.” That is when Lloyd and the players realised that they needed a completely different attitude if they were going to compete at this level. And they needed their own battery of fast bowlers, which Lloyd searched the Caribbean for. It was fitting that the team finally matured in England, the home of the former colonial masters. Tony Greig, the South African-born captain, didn’t rate the West Indies after their abject performance in Australia and said that when they were down, they “grovel” and he intended to make them “grovel” in England. Given the existence of apartheid in South Africa at the time, it was a tasteless remark to say the least. But it had the effect of firing up the West Indies team, who made Greig a particular target. Greenidge says of the tour: “Everyone wanted to give the West Indian people living in England something to hold on to, people who were looking up to you, who were willing you on for support.” Thousands turned up for the Test matches and after the first two matches ended in draw, the West Indies triumphed in the next three. The success of the cricket team was paralleled in the field of music with Bob Marley and Jimmy Cliff as a cultural revolution followed the political revolution that had won independence. 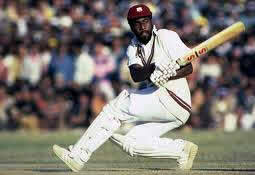 For Viv Richards, who became the world’s leading batsman, Marley’s call to “get up, stand up, stand up for your rights” was his “battlefield music” when he went to the crease. Richards wore a multi-coloured armband: “Green for the land itself, the yellow for the gold taken away and stripped away, the red meant the blood that was shed.” The film is being shown in selected cinemas around the country. Go and see it if you get the chance, even if you don’t like cricket!